Though Birgit Blyth began her photographic career using conventional photographic methods, she quickly became more interested in alternative processes. In the mid 1990’s a colleague showed her an article in Scientific American and it was here that she first discovered the technique called “chromoskedasic” painting, which would eventually lead her to fully finding her voice as a photographer. Blyth had always aligned herself with and been moved by abstract expressionist painting. The series of veil paintings by post-abstract expressionist, Morris Louis, was especially inspiring to her and caused her to ask herself how she could do similar interpretations photographically. In “chromoskedasic” painting, she found the answers and would begin on a new path in her artwork. 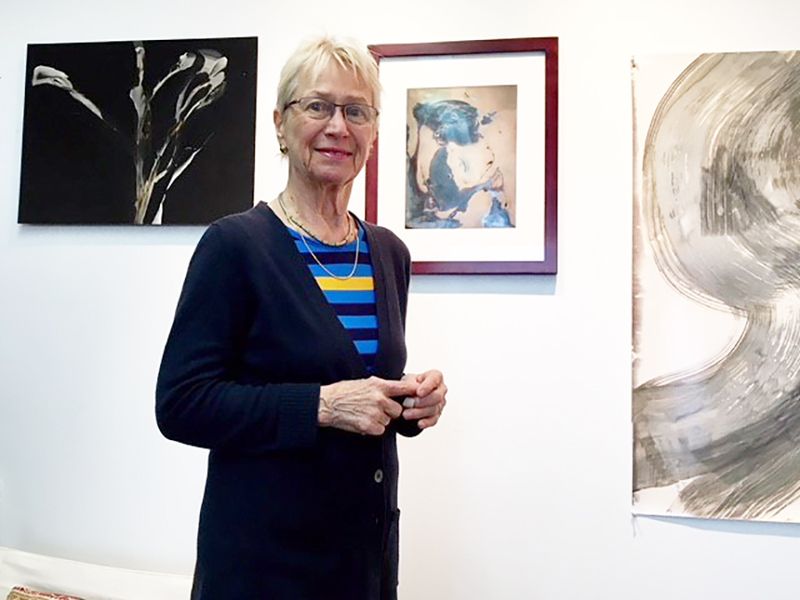 Because the chromoskedasic work is all analog, Blyth spends much of her studio time in the darkroom, which has become a rarity in the current world of digital photography. She does however, continue her preference for experimentation in numerous directions, even employing aspects of the digital age – this exhibit will also feature a new series of pieces created with the now defunct but much loved SX-70 polaroid camera, scanned and archivally printed on 24” x 24” fine cotton rag paper. Whatever the process, Blyth’s work is, as the painter and poet, Peter Sacks noted, a blend of “precision and mystery, of articulation and atmosphere.” Her images leave us with the feeling of ongoing action despite the apparent stillness; of qualities both dreamy and stark as light hits a stand of birch trees in a valley or a group of buildings in New York City. As Morris Louis evolved a style of painting that produced a complete integration of paint and canvas, so too has Blyth, with photo paper and chemicals, created a perfect integration of method and content. Painting in the darkroom with activators, developer and stabilizers.